The Minooka Flight Invitational is one of the most interesting meets taking place this week. The meet consists of 9 races for each gender; each 1-7 runner races in their own flight against their other respective runners. There is also a fresh/soph and open race, with plenty of competition to go around. Last year the Downer's Grove North boy's killed this meet on their path to Nike Cross Nationals, scoring a mere nine points. With the likes of Jacob Ridderhoff, Ryan Birkmeier and Miles Christensen are gone, the Trojans are no longer the powerhouse they were last year, opening the field up some more. After a phenomenal showing at First to the Finish last week -- moving them up 19 spots in our top 50 list - the Lyon's Township boys really made some noise. Lead by junior Jack Ehlert, the Lions placed 2nd behind the team from Fishers, Indiana. Challenging them for the team trophy is newcomer El-Paso Gridley, a 1A team who also placed 2nd in their race at First to the Finish. This meet is more about individuals though, and there is no lack of them. Looking to reclaim his title and bounce back from an illness, which hindered his race last year is senior Tommy Brady of Maine South. Last year Brady ran a solid 15:03 to defeat Clayton Mendez of Whitney Young; Kilrea of Lyons did not run. The championship race looks to be almost identical to last week's 3A race at First to the Finish. Senior Jack Roberts of Downers Grove North took second, junior Tyler Cushing of Bolingbrook in third, senior Sam Rivera from Whitney Young in fourth, and junior Jared Kreis from Lincoln-Way Central in fifth. Freshman Asa Smith from El Paso-Gridley was their number one runner last week, so we get to see some more of him as he really grows a name for himself. Overall, this meet is full of incredibly runners who all look to be battling for not only this race but also a chance at state later in the season. While not in the same class, the girl's race will feature an epic showdown between rivals 2A Belvidere North and 3A Yorkville. Yorkville won this meet last year with 13 points, Belvidere North in second with 20 points, Batavia with 23 and Minooka with 25. With Naperville Central added into the mix, the competition got that much better. Last week at First to the Finish, Yorkville placed third, Minooka fourth, Batavia fifth and Lyons Township sixth, so these teams are already acquainted with each other and will most likely battle throughout the season. Yorkville actually placed second as a team last year at 3A state, only losing Alyssa Edwards; they have a long history of program success. Meanwhile Belvidere North won First to the Finish but also took second at state last year, losing senior's Sabrina Elder and Mia Rodriguez. Speaking of First to the Finish, sophomore Brooke Stromsland of Lakes Community dethroned junioe Madison Diercks of Belvidere North in the 2A race. Diercks is also the returning winner for the Championship Flight, so only time will tell if Stromsland takes this race from Diercks. 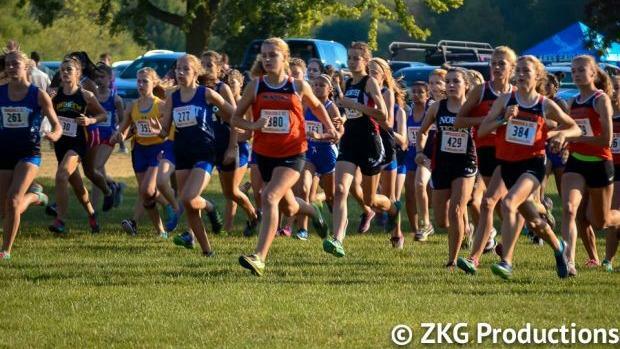 Diercks and Stromsland are not the only ones with their sights on first place, as freshman Katrina Schlenker of Batavia has some serious potential. In her season opener, Schlenker ran a blazing 16:42 to take the crowd by surprise and secure the win in the 3A race at FTTF. Some other notable racers include sophomore Helena Kleronomos of Yorkville, junior Kailey Fox also of Yorkville, senior Vivian Van Eck of home team Minooka, and sophomore Kate Dickman of Lyons Township. While she's from a 1A school, senior Cate Atkins of El Paso-Gridley can also hang with the big dogs and should not be counted out of this race. Overall, this looks to be another great race full of excellent competition.